The kitchen is no longer the tucked away corner of the house, with a lot of experimental types of best modern kitchens in India; there is the new concept of the Open Kitchen right in the middle of the house. With an inflow of best modern kitchen ideas, people are more into making the kitchen the active part of the house. However again despite the open-concept contemporary kitchen in Mumbai, Delhi etc being a trending option, people are also equally embracing the closed-off classical kitchen in India albeit with a twist! Thus, the debate continues as to which style of luxury kitchen in India is the most preferred choice. The tip is to choose the luxury kitchen in India that best meets your lifestyle demands. The open kitchen is actually integrated with the adjacent living room or the dining room. This contemporary kitchen in Mumbai, Delhi, and other cities, is usually ‘open’ from more than one side, with the lack of walls on more than one side. Open kitchens are brighter with better lighting and well-ventilated as against the closed-off kitchens. Open kitchens give the opportunity for interaction with anyone working in the kitchen and perhaps guests in the living room. Cooking time needn’t mean missing out on interesting conversations with visitors, encouraging better bonding with family and guests. Open kitchens bring in an air of informality to the house, integrating the cooking session to other activities in the house. Open kitchens blends in with the house décor and could add an interesting element of design to the house, especially in the way it is structured. The open kitchen even adds a sense of space to the house with all the extra space saved from no walls. It is hence great for smaller homes with less area. It is a great space-saving option. Finally, an open kitchen fills the house with the aroma of good food and all the baking! Open kitchens are best for modern and contemporary homes. However, integrating your kitchen with the living room especially and keeping it open causes all the unwanted smells of stale or burnt food and the sight of dirty dishes to go into the other areas of the houses and won’t be a pretty sight especially for guests. It showcases the mess during cooking. Furthermore, the sounds of the kitchen appliances will make the way for disturbing noises into other rooms and other areas of the house. Closed kitchens are traditional kitchen style in a room of its own. The walls surrounding this classical kitchen in India separate it from the rest of the house making it an isolated entity. A closed kitchen is more formal. Unlike an open kitchen, the closed kitchen is a world of its own, keeping the area of cooking separated from other functions in the house. In a closed kitchen, due to the four walls, there is more space for wall cabinets, a bigger countertop, more shelves, and storage space for appliances. A closed kitchen works best for uninterrupted cooking, without any kind of disturbance from the outside world. A closed off kitchen keeps the kitchen mess and other smells concealed. Along with the sounds of kitchen appliances is confined too. The closed kitchen most often lacks good ventilation and is often darker with less light coming in. A closed kitchen is more cost-effective because tearing down the walls for an open kitchen involves more investment and is time-consuming. What’s right for you: Is there a middle path? 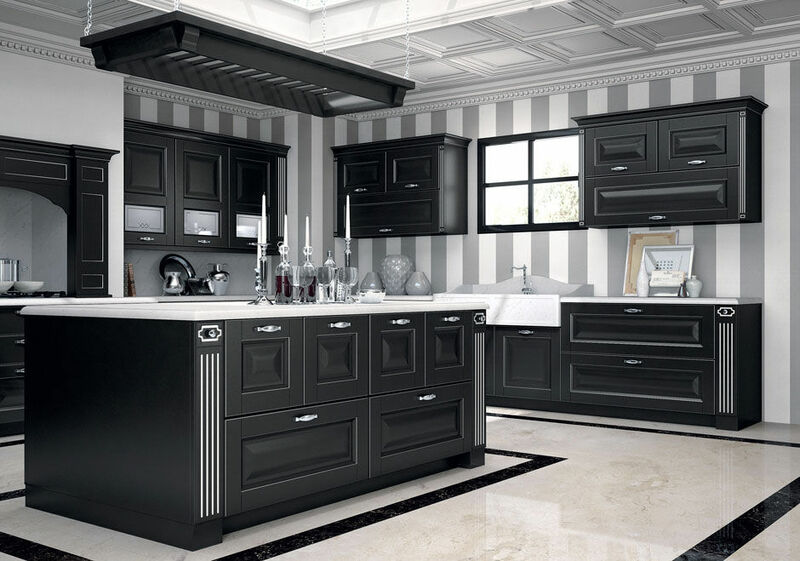 There is no given as to which luxury kitchen in India will work better in your house. It is essential to take into consideration your lifestyle, and the way you use your kitchen. It is all about the needs. An open kitchen works best in a family with kids that need supervision, but a couple who loves to entertain might need a closed off kitchen for preparing meals ahead of time, for instance. You can choose from the best of imported kitchens in India by the leading luxury kitchen India brands like Ballerina Kuchen India, and other contemporary kitchen companies in Mumbai, Delhi, and other cities. However, if you want the best of both and the cons of none, there is a middle way to combine the open kitchen layout with the closed kitchen style. Read about it in the next blog post!